According to the Georgia Governor's Office of Highway Safety (GOHS), more than 140,000 traffic crash-related injuries are reported in the state each year. Along with lacerations and contusions, broken bones are one of the most common injuries sustained in car accidents. 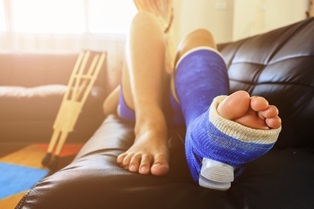 Depending on the severity of the fracture, broken bones frequently require extensive medical treatment, significant recovery time, and ongoing physical therapy. These medical expenses may cause an accident victim to experience financial hardship. However, people who've suffered injuries and other losses due to another driver's or company's negligence may be eligible to file a personal injury lawsuit and seek compensation for a wide range of damages. Are you considering taking legal action for broken bone car crash injuries? Here's what you should know. Stable fractures. Also known as non-displaced fractures, the ends of the bone break align and aren't noticeably out of place. Open compound fractures. In these breaks, the bone—or an external object—breaks the skin, and the bone may or may not be visible. Transverse fractures. These types of breaks feature a horizontal fracture. Oblique fractures. While transverse injuries have horizontal fracture lines, oblique breaks have angled fracture lines. Comminuted fractures. One of the most severe breaks, because the bone has shattered into multiple pieces, making it difficult to repair. Immobilization. After setting or repositioning the broken bone, doctors often use splints, or plaster or fiberglass casts, to hold pieces in place for healing. In some cases, doctors may also use a functional cast or brace that reinforces the broken bone while allowing for limited movement of nearby joints. Traction. This treatment uses a gentle and steady pulling action—accomplished with the use of ropes, pulleys, and weights—to stabilize and realign fractured bones, which is helpful before surgery. Orthopedic surgery. Sometimes it may be necessary for doctors to insert metal screws, plates, rods, and other hardware to hold the fractured pieces of bone in place. Physical therapy. People with broken bones often require physical therapy to rebuild immobilized muscles and regain a more fluid range of motion. If you suffered broken bones in a car crash caused by someone else's negligence, you might be entitled to compensation for medical expenses, property damages, lost wages, loss of income, and pain and suffering. The knowledgeable car accident lawyers with Van Sant Law will help you understand your rights and options. Contact us today to schedule an appointment for a free initial case consultation.